Your sleep will be out of this world thanks to CoolPass technology—the same technology designed to provide astronauts comfort during space missions! Protect your pillow and improve the quality of your sleep with the Bambi Coolpass Pillow Protector. Hot summer nights are a breeze thanks to the space-age Coolpass fabric that absorbs moisture helping it to evaporate and produce a cooling effect - which keeps you cool and dry. It’s soft and stretchy and designed for a snug fit on standard pillows so there’s no uncomfortable bunching or impact on the feel of your pillow. 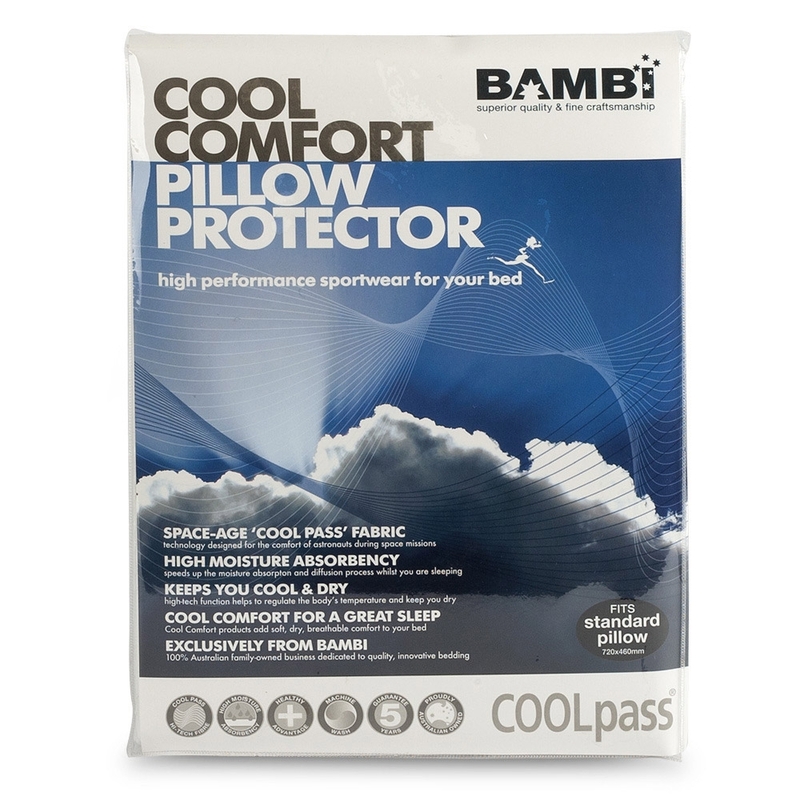 The high-tech fabric of the Bambi Coolpass Pillow Protector can help regulate your temperature while you sleep. It can keep you cool and comfortable on hot summer nights and nice and cosy when the temps get chillier in the winter. The Bambi Coolpass Pillow Protector’s high quality fabric provides all the comfort and softness you could want when you’re in bed. It’s also durable, machine-washable, and quick-drying. It measures 72 x 46 cm, which is perfect for standard pillows, and is ideal for use on latex or memory foam pillows. Protect your pillow and enhance your sleep with this innovative pillow protector. Bambi, an Australian family-owned company started over 30 years ago, holds the prestigious Woolmark Gold label licence and have won a Central Coast Manufacturers Award for innovation in design and manufacture, and an Australian Furniture Excellence Award. Have been waking several times a night in a lather of sweat but no more - best purchase ever! Perfect - just what I've been looking for!